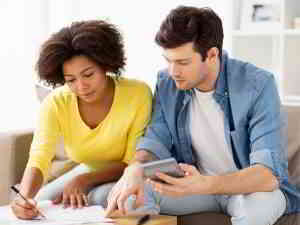 When you’re single, making and keeping to a household budget can be relatively easy. Because there is only one person to focus on, you have a better idea of income and your expenditures. Add another adult and more or more kids to the equation, and home budgeting becomes much more difficult. Typically, a family has dual or even multiple sources of income. Unfortunately, with multiple sources of money come multiple expenses. It’s for this reason most families lack a formal budget. Creating and keeping to a household budget can greatly improve your family’s financial outlook. Take into account your entire household income. If anyone’s income changes from month to month use a general average or the lowest amount. For a month, keep track of all home expenses. Do so by keeping receipts and billing statements, including online charges. Add up all monthly expenses including bills, groceries, and everyday expenses such as transportation costs like gas and even mileage. Discuss ways of trimming costs with the entire family. This strategy will help you figure out which expenses are needed and ones that be cut down or altogether eliminated. Simple ways to cut down on expenses might include taking your lunch to work or cutting down your children’s extracurricular activities. Brainstorm how to cut down on your needed expenses as well such as using coupons while grocery shopping or opening the shades for more natural light. Carpooling, public transportation, generic foods, and adjusting the thermostat are a few other swaps that can cut your family expenses down. After you’ve taken the first few steps figure out how much you could save on regular expenses and then cut out anything unnecessary; crunch the numbers again and see where you stand. At this point you might even have enough to put some away in savings, if not, rework your budget until you’re bringing in more than you spend. When you make your family budget, make sure that where ever you cut back on spending, that it’s realistic and something the entire family can keep to. For example, cutting entertainment out of the budget completely might look good on paper, but we all need a little diversion every now and then. Instead of cutting entertainment out of your household budget completely, consider finding ways to lower the cost. One way to save is to dine in, renting a new release for a movie night at home. Creating a family budget is a way to help you keep spending under control. This leaves more money available to you for paying down your debts and for savings. If you need help with your personal and family budgeting, AmOne can help. Our knowledgeable associates are ready answer your questions on home budgeting, financial planning, debt consolidation, credit repair, and more. AmOne offers solutions; your call to us is free and we won’t try to sell you anything. Find out how to reach us and learn more about how AmOne can help you today.